The India International Hot Air Balloon Mela was held in Delhi from 13th to 28th November 2010. The inaugural hot air balloon was from near Rajghat, Mahatma Gandhi Memorial. This was the first time a Hot Air Balloon Flight was initiated from near Rajghat. To commemorate this event, 50 individually numbered Special Cards were prepared by Nikhil Mundra, Gandhi Philatelist (www.gandhistamps.com). 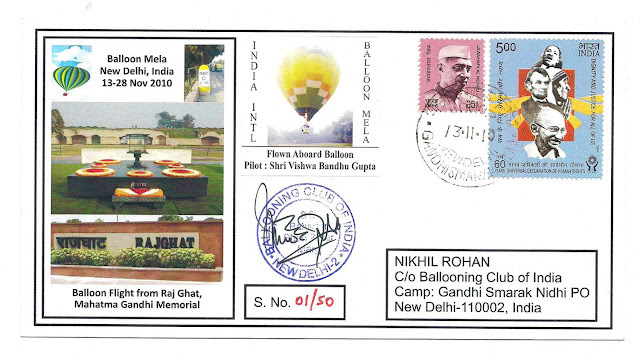 All 50 cards were then flown aboard the inaugural flight of the Balloon Mela from Rajghat on the 13th November 2010. 1) They have been postmarked on 13th November 2010 at Gandhi Smarak Nidhi PO. This post office is specially set up for servicing the Rajghat and the nearby Gandhi Museum. 3) US President Barack Obama, an admirer of Gandhiji’s principles, had paid homage to the Mahatma by visiting Rajghat on 8th November 2010, just within a week preceding to this balloon flight. 4) 25 paise Pt.Nehru stamp additionally used – Nehruji’s birthday falls on 14th November, a day after the Balloon flight. 5) An image of the balloon on which the cards were flown is also depicted on the cards as part of an additional sticker. 6) The cards have been signed by the Pilot of the Balloon flight and affixed with the seal of the organizing body, the Ballooning Club of India.